There’s an old joke (or perhaps “observation” is a better word) that if socialists understood economics, there wouldn’t be any socialists. But who can blame them for trying? There’s no better way to prove your philosophy than by living it, and capitalists have been proving their system works by starting their own businesses. Meanwhile, you’re more likely to find a socialist asking what kind of milk you want with your latte than running a business, but that was going to change when a group of socialists opened up a restaurant in Grand Rapids, Michigan, governing the business with their socialist ideals. The restaurant originally named “Bartertown” was a collective, meaning the business was employee-owned. They owned the “means of production” in other words, there are no bosses. All workers received equal pay and had an equal share in decisions made for the business. Waiters didn’t receive tips either, because what socialist would want to reward hard work? The end has come for a popular Grand Rapids restaurant known as much for its creative vegan dishes as its progressive business model. For much of its five-year existence, the eatery went by the moniker Bartertown Diner, until it was rebranded in September to The Garden Diner and Cafe. Their last day of business was on November 30th. Both Bartertown and Cult Pizza, which opened in 2013 and closed earlier this year, were started by Ryan Cappelletti, a vegan chef with a plan of creating a sustainable restaurant model with baker Roxanne “Roc” Aguilar. Employees would be expected to join the union, Industrial Workers of the World, he said. A Facebook post from the cafe disputes that, however. 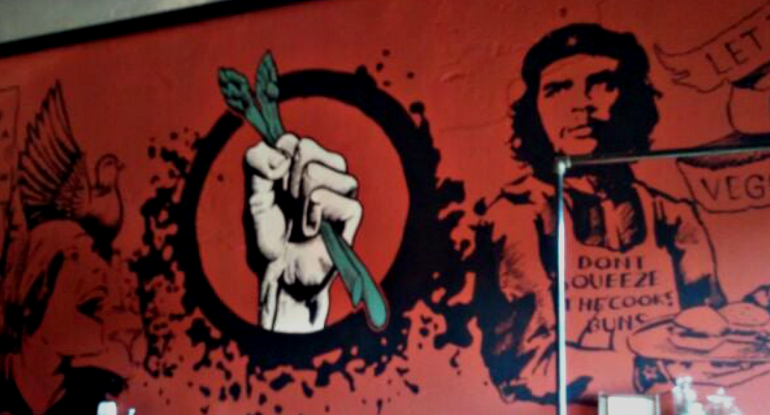 In keeping with the worker empowerment theme, he commissioned a mural depicting Marxist revolutionary Che Guevara, Chinese communist leader Mao Zedong and other provocative leaders tackling restaurant duties. The living wage, no-tipping model required the restaurant to do a high level of sales to sustain the higher operational costs, he added. While the restaurant’s menu garnered a loyal following and hefty praise, there were complaints about 40-minute waits for sandwiches and limited hours of operation. The satirical paper The Onion published an article titled “Marxists’ Apartment A Microcosm Of Why Marxism Doesn’t Work” over a decade ago, and we can’t help but think their satire was reality at the restaurant. I’ll repeat the key irony in the story: their restaurant failed because people got tired of waiting in lines. At least they got the communist experience down pat.